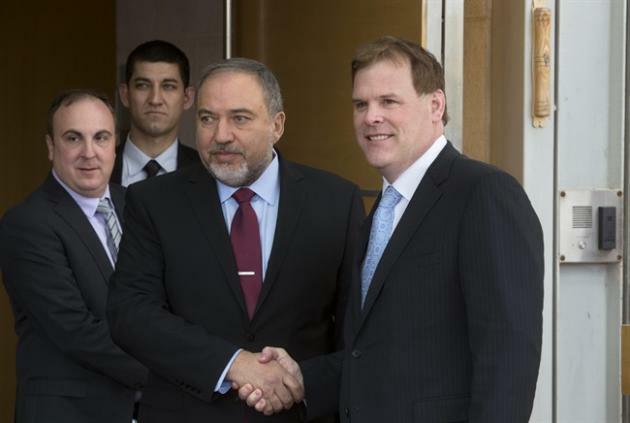 Israeli Foreign Minister Avigdor Lieberman, center left, shakes hands with his Canadian counterpart John Baird during their meeting in Jerusalem, Sunday, Jan. 18, 2015. Foreign Minister John Baird meets with Israel's prime minister today as he continues a trip through the Middle East. Baird is expected to talk to Benjamin Netanyahu about about regional security issues, the Middle East peace process and trade. Baird received a less than warm greeting on Sunday when he went to meet with Palestinian officials. Demonstrators unhappy with Canada's staunch pro-Israel stance pelted Baird's motorcade with eggs and shoes but none struck the foreign minister. Baird issued a statement saying his meeting with Palestinian Foreign Minister Riad Malki was "cordial and constructive" and featured some candid exchanges on issues the two sides differ on. Later Baird met with his Israeli counterpart Avigdor Lieberman. Canada has been one of only a few Western countries to stand by Israel as it has come under fierce international criticism over deadlocked negotiations with the Palestinians, the recent Gaza war and its settlement building. Canada has expressed opposition to the Palestinians' unilateral attempts to reach statehood as well as its recent bid to pursue war crime charges against Israel at the International Criminal Court.